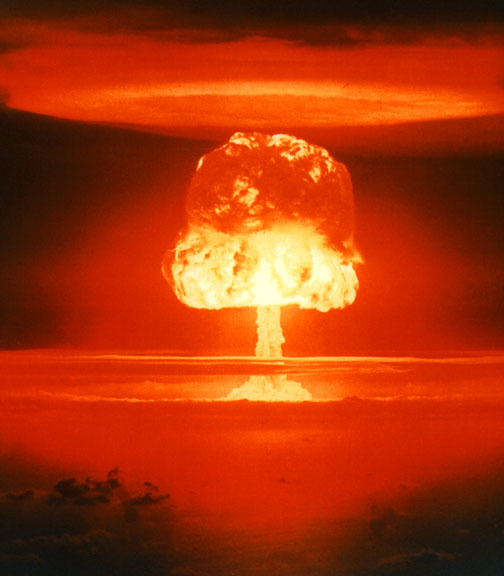 During the Cold War, the prevailing doctrine in both the US and the USSR concerning the use of nuclear weapons was called "Mutual Assured Destruction," or "MAD." (The acronym, as we will see, was quite appropriate.) This strategy, if such it can be called, was predicated on (1) nuclear parity, and (2) a devastating response if one side attacked the other using nuclear weapons. In other words, if the USSR launched a first strike on the US, the latter could not defend against it but would retaliate with a sufficient number of warheads to assure the virtual destruction of the Soviet Union. This fact, of course, was to deter the Soviets from doing this in the first place (the term "deterrence" practically became a household word). And, of course, the reverse was true, i.e. ; Soviet retaliation would deter a US first strike. So, in theory at least, the only thing stopping one side from attacking the other was the surety that a devastating counterattack would result, leaving nothing but smoldering, radioactive ruins. Both the US and the USSR were working on Anti-Ballistic Missile (ABM) systems in the1960s, the idea being developing a capability of shooting down enemy missiles before they reached their targets. The US started with a version of the Nike surface-to-air missile (SAM) system called the Nike Zeus, while the Soviets concentrated on developing what NATO called the ABM-1, or Galosh. 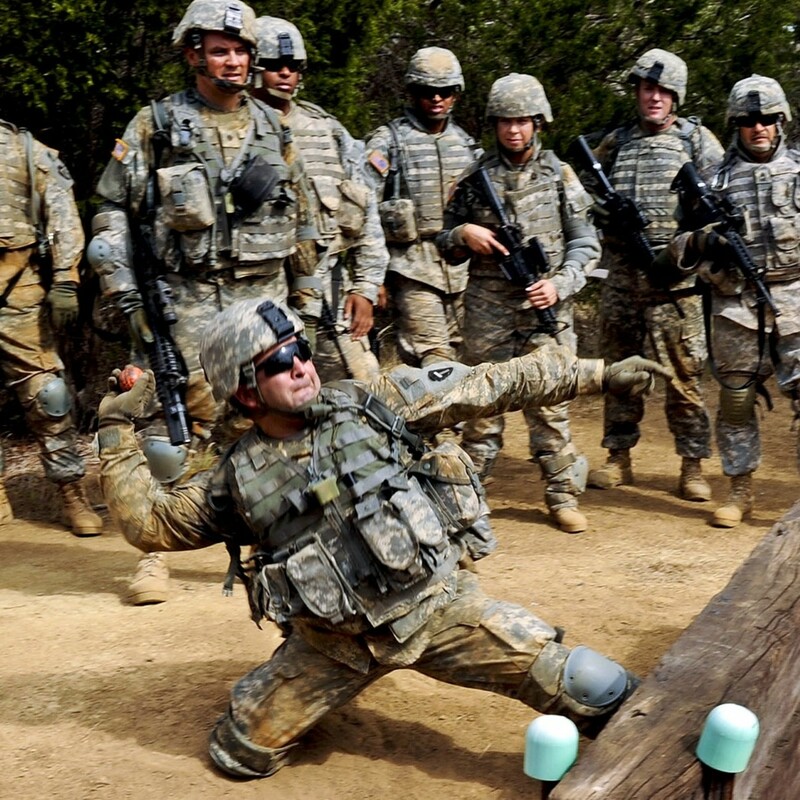 (NATO code names are based on words that all members of the North Atlantic Treaty Organization could pronounce. These names began with the first letter of the type of weapon system so Soviet bombers were called Bison, Blackjack, etc. Ground-to-air-missile systems such as the ABM began with a G as the letter S was reserved for surface-to-surface missile systems such as ICBMs. One Soviet ICBM, the SS-18, was nicknamed "Satan.") The Nike Zeus was scrapped a long time ago but the ABM-1 system lives on and is deployed around Moscow. 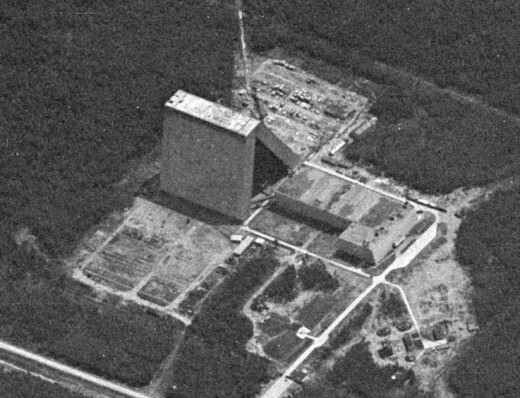 In 1972, Washington and Moscow signed a treaty that limited each nation to one ABM site, either defending ICBM silos or the national capitol. The US chose Grand Forks Air Force Base in North Dakota (where ICBM silos were nearby) and the USSR chose to defend Moscow. The ABM system ("Safeguard") was abandoned in less than a year (its radars were incorporated into the overall early warning system) and, as stated previously, the Moscow system stands, albeit with updated systems. (When President Reagan announced the Strategic Defense Initiative, or SDI, the Soviet reaction was considerably different! More on that later.) I remember the debate at the time and, frankly, I wondered why anyone would object to missiles deployed to defend us against nuclear weapons landing on our soil. But the "not in my backyard" mindset was prevalent in much of the country. (Some of this was predicated, ostensibly, on not having to live close to a target which an ABM site would certainly become. Some of this was based, unfortunately, on not wishing to see the US gain a strategic advantage over the Soviets. Yes, you read that right - Americans against America gaining a strategic advantage over the Soviet Union. Again, more on that later.) So, in 1972 we signed the treaty, but the Soviets, to which I can personally attest, continued work on ABM technology. 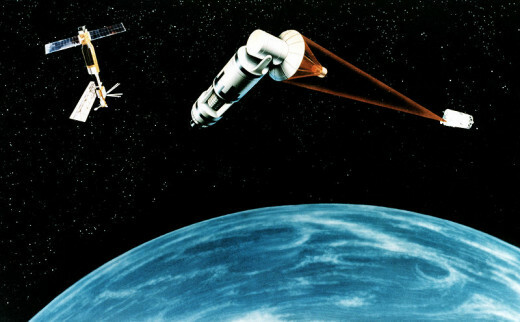 In 1982, former Army Lieutenant General Daniel O. Graham, then an advisor to President Ronald Reagan, founded an organization called "High Frontier," its purpose being to advocate a space-based missile defense system, and he published a report called “High Frontier: A New National Strategy.” The report argued for the adoption of a defensive posture based on a high-tech, multi-layered missile defense system designed to negate a Soviet (or Chinese) strategic attack instead of relying on MAD. President Reagan ran with it and, on 23 March 1983, Reagan announced his decision to embark on a missile-defense system; thus SDI was born. It was headed by Air Force Lieutenant General James Abrahamson (called "General Abe" by some - I have an autographed picture of him on my wall in my study). To say the Soviets -- and their "fellow travelers" -- went nuts would be an understatement. Here was an American president threatening to undermine the one thing that made the USSR a "superpower" - their strategic, offensive nuclear capability. (Back then I heard the USSR described as a "third-world nation with nukes" more than once. It was quite accurate.) The Soviet propaganda machine went into high-gear! This was to be expected but what was troubling to me was the fact that people on our side, generally those of the liberal persuasion, argued passionately against SDI as well.  SDI would upset "MAD" and lead to a new arms race and overall instability.  Such a system could never be 100% effective so a few warheads would undoubtedly get through.  It would never work in the first place.  Such a system would not deter a "suitcase bomber" - i.e., a nuclear weapon smuggled into the US in a truck or a boat and detonated, say, in Washington, DC. A more cynical reason in play was this: if the US had an effective missile shield (or at least a shield perceived to be effective - in military strategy, perception is everything) - then an American president would be tempted to launch a first strike against the USSR. God forbid our own country having strategic superiority! I said it then and I say it now: the United States would never launch a first strike using nuclear weapons against an adversary without an overwhelming, compelling reason such as a massive invasion of Europe by Soviet forces (see accompanying sidebar). With respect to the "it will never work" argument, the Soviets knew all too well that, if Americans put their mind to it, our technological prowess would eventually overcome all obstacles and we could establish such as a system if we tried. As far as being unable to deter the smuggling of a nuclear weapon into the US is concerned, this argument was really irrelevant. The system was not supposed to be able to accomplish that - that constitutes a different problem set. Besides, because you cannot effectively defend against one potential threat, should you then not defend against all others? All in all a ridiculous argument. 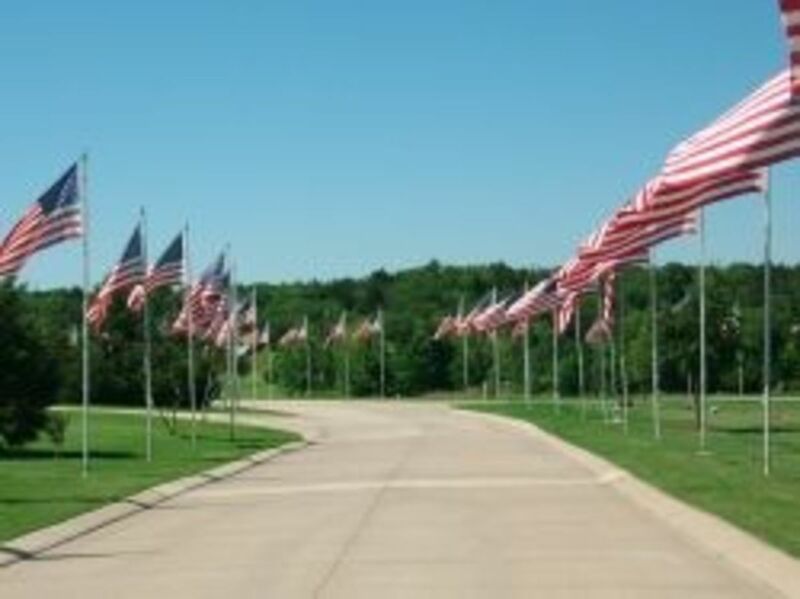 The argument heard the most, however, was about the overall effectiveness of such a system; i.e., it could never destroy all the warheads from getting through and even one nuclear warhead detonated over a US city would be unthinkable so we should not deploy such a system in the first place. Trouble is, this argument ignores one of the critics' favorite concepts: deterrence. Consider: you are a strategic planner in the old Soviet Union, drawing up plans for a disarming first strike ("counterforce" - see sidebar) against the US. But you realize the US has deployed a comprehensive, strategic defense system consisting of space-based and ground-based weapons designed to intercept enemy missiles in the boost phase, post-boost phase, and terminal phase (ballistic missiles are just that - ballistic. The missile boosts the warhead(s) into space -- boost phase -- the warhead(s) separate and begin descend -- post boost -- and then hit the target -- terminal phase). What you don't know is how effective the system is; i.e., what percentage of the raid size can be expected to be intercepted. SO -- let us say the system is deemed to be around 60% effective but we have publicly claimed its effectiveness to be in the 80-85% range (remember perception is everything). Now you are faced with the dilemma that a large number of your warheads (as much as 85%) will not reach their targets. Furthermore, you do not know which ones will and which ones won't. I don't know about you, but I would not launch such an attack given so many unknowns. It seems to me that a robust strategic defensive system, even one considerably less than 100% effective, would in and of itself provide a major deterrent to a nuclear attack. As an aside, I truly believe President Reagan's stubbornness in refusing to give up SDI in the strategic arms negotiations with then-General Secretary Mikhail Gorbachev was instrumental in eventually bringing down the Soviet Union. 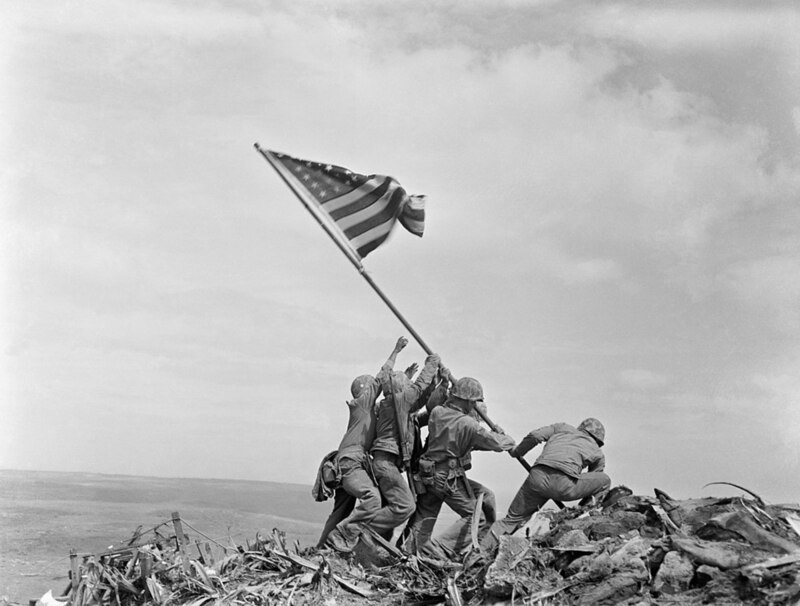 Their huge military spending was crippling their economy and they knew they could compete with us on that level. "The Missile Defense Agency's mission is to develop, test and prepare for deployment of a missile defense system. Using complementary interceptors, land-, sea-, air- and space-based sensors, and battle management command and control systems, the planned missile defense system will be able to engage all classes and ranges of ballistic missile threats. Our programmatic strategy is to develop, rigorously test, and continuously evaluate production, deployment and operational alternatives for the ballistic missile defense system. Missile defense systems being developed and tested by MDA are primarily based on hit-to-kill technology. It has been described as hitting a bullet with a bullet - a capability that has been successfully demonstrated in test after test." We now have a Terminal High Altitude Area Defense (THAAD) system which has been deployed. The Obama administration has apparently decided not to deploy a BMD system to eastern Europe but is concentrating on homeland defense (this has made Moscow very happy even though the European-based system was designed to deter countries such as Iran and Syria and would not have been much use against Russian ICBMs but, again, perception is everything). Now, in response, to the rather ridiculous posturing by North Korean strongman Kim Jong Un, we are planning to deploy a missile defense system on Guam. The Democrats are finally realizing the value of missile defense after years and years of criticizing the concept and actively working against its development. 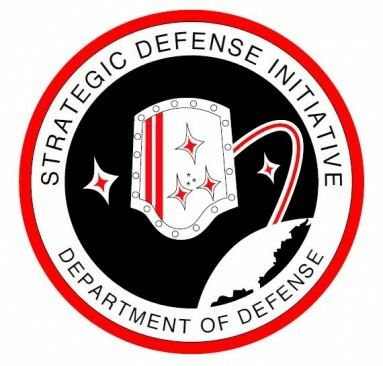 It seems to me that, if we had continued with the SDI program as President Reagan initially envisioned it, we would today have an operational, effective system capable of defending the US and its allies against virtually any missile attack from any potential adversary. So now we have to play catch up. 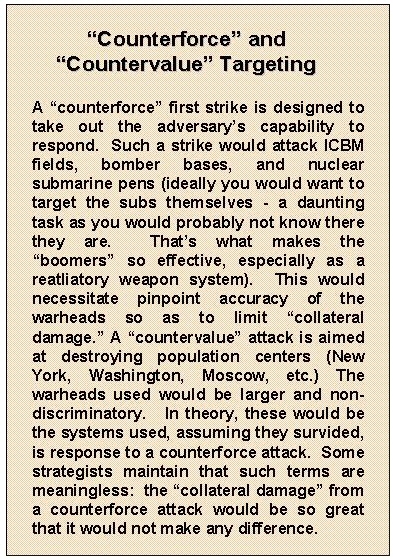 I can hear a counter-argument now - we would have a complex, extremely expensive designed to negate a threat that no longer exists - a Soviet first strike. But is that true? Russia still has a large ICBM and SLBM (submarine launched ballistic missiles) force as do the Chinese. And here come the Iranians and the North Koreans, both ruled by men who are probably certifiable maniacs and both of whom have threatened the US and its allies. Is there such a thing as "too much defense?" I'll let the reader ponder over that one but I know which side of the argument I fall on. "While the debate continues over how soon Iran or North Korea might be able to develop an intercontinental ballistic missile (ICBM) that could strike the US mainland, the US government is forging ahead with controversial plans to beef up its domestic missile defense capabilities well before any threat has materialized. In September, the Missile Defense Agency (MDA) announced that in addition to the two ground-based interceptor (GBI) sites it operates in Alaska and California, it has started looking at five potential locations to house a third site in the eastern US. Inspecting a variety of sites will allow the Pentagon to begin environmental assessments if a skeptical Congress eventually reaches agreement on the project and finds the necessary funding. 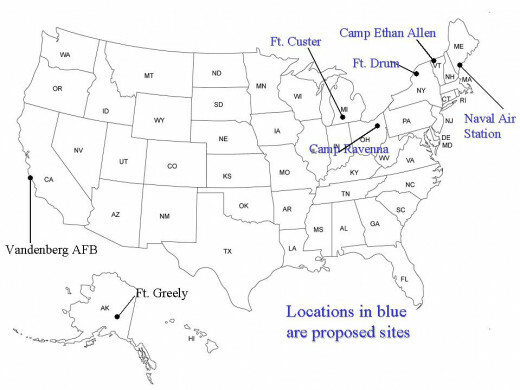 The prospective sites at Fort Drum, N.Y.; Camp Ethan Allen Training Site, Vt.; Naval Air Station Portsmouth, Maine; Camp Ravenna, Ohio; and the Fort Custer Training Center, Mich., are all on federal land. The existing GBI sites at Fort Greely, Alaska, and Vandenberg Air Force Base, Calif., house a total of 30 missiles, with another 14 to be added at Fort Greely by 2017 at a cost of about $1 billion." This would give us a total of three sites and significantly increase our chances of intercepting an incoming threat. Now to convince Congress and the environmentalists! President Ronald Reagan Introduces SDI on March 23, 1983. President Reagan was a visionary, and we need more leaders like him! This place looks like it's way too unsafe to inahibt. It would make sense though. Even if people weren't panicking about the apocalypse like they are here in the US a nuke site can provide lots of good living and storage space. In fact it probably had plenty of goodies left over in it.I think the only reason people didn't swoop in and start setting up home there is because of all the looters, some practically foaming at the mouth for cash so putting yourself there would put you between madmen and money, a place no normal person wants to find themselves in.But now it's been abandoned too long and restoring it to a point where it's safe to inahibt day in and day out wouldn't be worth the effort. This is a fantastic hub with great information on missile defense systems and where it stands today. I voted up, awesome and interesting.